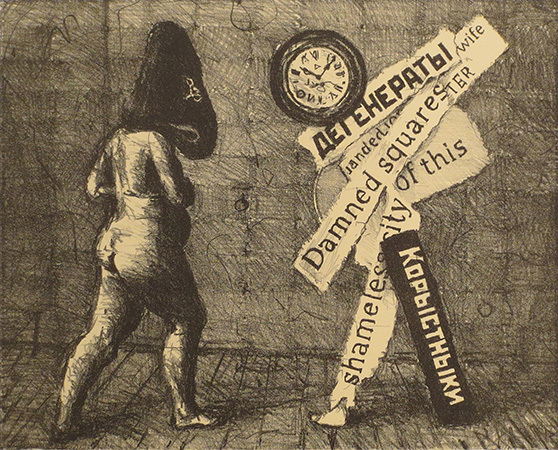 William Kentridge, Damned Squares of this Shameless City, 2009. Signed and numbered lithograph. Image size: 12 x 15 inches. Sheet size: 19 7/8 x 22 3/4 inches. Edition of 40. Courtesy of Robert Brown Gallery. The International Fine Print Dealers Association (IFPDA) is pleased to announce Fair highlights, the 2015 recipient of the Richard Hamilton Acquisition Prize and IFPDA Book Award at its annual Print Fair, running from November 4–8 at the Park Avenue Armory. The Print Fair will showcase 89 dealers exhibiting rare and important prints from Old Master to contemporary periods as well as new-to-market editions. A few highlights include three new prints and anexclusive performancefrom appropriation artist Mike Bidlo. Bidlo’s prints will be exhibited at World House Editions,and for his performance Bidlo will sign 73 audience membersturning them into “living sculptures.” Andrea Andreani’s Abraham’s Sacrifice of Isaac, after Beccafumi will be presented by David Tunick. The multimedia artist Julie Mehretu will present a monumental new project at Niels Borch Jensen Gallery and Editions, consistingof six panels, totaling approximately 7.7 x 17 feet, and combining etching and photogravure prints. Frederick Mulder Ltd. and John Szoke will each present strikingly distinct yet complementary iterations of Picasso’s “Jacqueline” portraits. Contemporary publisher Mixografía will exhibit their newest project withnoted conceptual artist John Baldessari, along with a rarely seen edition by Alberto Burri they published in 1990. Arion Press will present their newest artist book project with William Kentridge, The Lulu Plays, featuring 67 drawings by Kentridge alongside text of the original Lulu story by playwright Frank Wedekind, which inspired the Alan Berg opera Lulu. To coincide with Alan Berg’s epic tale of a femme fatale opening at the Metropolitan Opera in New York, Robert Brown Gallery will present a selection of William Kentridge’s prints. The Cincinnati Art Museum will be announced as the fourth recipient of the IFPDA’s Richard Hamilton Acquisition Prize, sponsored by Champion & Partners and named after the acclaimed print artist Richard Hamilton. The award, established in 2012, provides up to 10,000 USD to support a museum acquisition at the IFPDA Print Fair of one or more prints from any period. The 2015 IFPDA Book Award will be presented to Clifford S. Ackley, the Ruth and Carl J. Shapiro Curator of Prints and Drawings at the Museum of Fine Arts, Boston, for his book, Holland on Paper in the Age of Art Nouveau, a beautifully illustrated and extensive celebration of the Dutch contribution to Art Nouveau. Founded in 1987, The International Fine Print Dealers Association is a non-profit organization of expert art dealers dedicated to the highest standards of quality, ethics and connoisseurship. The IFPDA has grown to include nearly 170 members in 13 countries, whose areas of specialization range from old master and modern to contemporary prints, including publishers of prints by renowned contemporary and emerging artists. The IFPDA aims to promote a greater appreciation and a deeper understanding of fine prints among art collectors and the general public through the annual IFPDA Print Fair, as well as public programming, awards, and funding for institutions via its public charity, the IFPDA Foundation.